Earlier this year, in January, a fire spread and burned down most of them, which resulted in the death of Becky Moses, a 26-year-old Nigerian woman who arrived at the site a couple of days before the incident. She was previously residing in Riace, a small town nearby that is famous for his resettlement programme for refugees, until her application for political asylum was denied. Sacko was a member of the USB (Unione Sindicale di Base), a trade union that fights to improve the atrocious working conditions of the farm laborers that are deployed in the citrus fields in the plains of Gioa Tauro, in Calabria. He was collecting scraps of metal in the former blast furnace “La tranquilla”, shut down due to the presence of toxic material, to help a fellow Malian worker rebuild his shack, when he was shot down in broad daylight with a hunting weapon. The San Ferdinando’s tent city was inaugurated by Silvio Berlusconi in 2010, after three labourers were shot with an air rifle in January of that year, an incident that originated many clashes between locals and foreigners which led to the creation of this ghetto created specifically to accommodate migrant seasonal workers. Most of its inhabitants are black young men from West Africa, most of them form Senegal, Mali, the Ivory Coast, Guinea Conakry, Burkina Faso, Gambia, Ghana. Mauritania, Nigeria and Togo. A great number of them are in possession of temporary permits to stay in Italy, nonetheless they work in slave-like conditions up to 12 hours a day for a salary of between 25 to 30 euros a day. 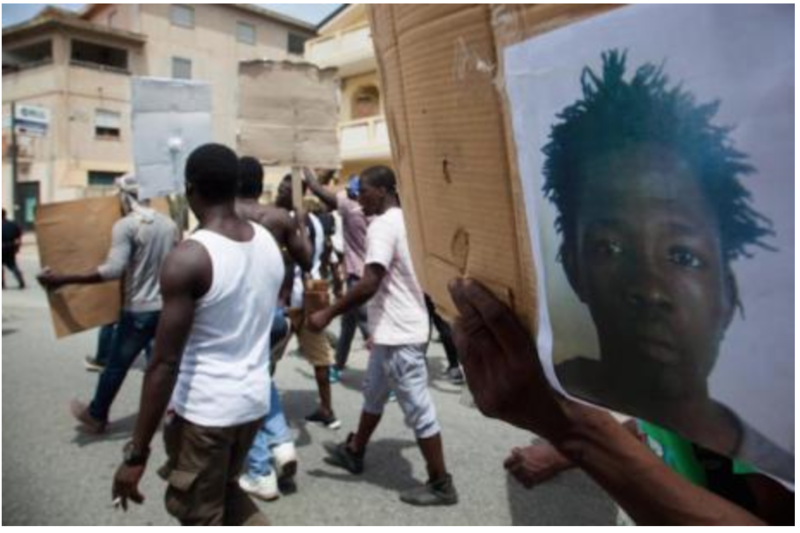 This tragic event is the latest in a series of racial attacks in Italy. On February 3 in Macerata, Luca Traini, a former candidate for the xenophobic Lega Nord to the local elections, drove around the city for two hours shooting and injuring several migrants. Traini, a fascist skinhead, is the incarnation of the far-right anti-foreigner revival that is spreading across Italy, and that resulted in the election, last week, of Matteo Salvini, the leader of Lega Nord, as Minister of the Interior. His first words as minister where that “the party was over” for migrants, and plans to expel half a million undocumented migrants.